Apparently this video is an attempt to warn kids off drugs. It's a Romanian anti-drugs campaign that makes out that when you're high, everyone, and everything, is a fit babe wanting to get it on with you. Only if you are not stoned do you get the brush off. In that case I reckon a lot of kids will be toking after watching this video. Now whenever your government tries to warn you from taking drugs you have to realise how totally hypocritical this is. Historical fact, real reporting, basic statistics and admissions from people involved in the drug game has shown that Western Governments from the US to UK and many others, have been deeply involved in drug dealing for many years. From the Opium wars between the British Empire and China, when China wanted to put an end to the epidemic of addicts related to Britain's importation of the drug hundreds of years ago, something Chinese students are still taught about, to the history of the CIA and their drug dealing activities to fund covert operations. It still goes on to this day. If you want to read a detailed 4 part report on how the CIA (Cocaine Importation Agency) have been dealing in coke, and Heroin for years now, this is part 1 of the article. It even has an interview with a Burmese man who used to be the biggest heroin dealer in the world. A reporter managed to get an interview with him and he apparently claimed that the CIA were his best customers! The series covers everything from World War II and the creation of the agency to Air America, Barry Seal, Mena Airport, The Contra's, Pablo Escobar and the CIA dumping LA into the midst of a crack epidemic. The Los Angeles black community attempted to sue the US government once a journalist (now dead of course), broke the story about the CIA protecting Freeway Rick Ross from the LA cops so that he could sell their crack, only for it to be thrown out of court on the grounds of National Security. Yes CIA drug dealing is National Security it seems. You can watch an interview with him below. The journalist who broke the story, Gary Webb, was found shot dead with 2 gun shots to his head. Guess what it was ruled a suicide. It seems a lot of people involved in uncovering devious exploits by the powers that be are found to commit suicide this way. They have to get their money for their black ops from somewhere and we don't want Congress or anyone sticking their nose into their dodgy dealings do we? Therefore the CIA have found the perfect way to fund their "off book activities" with drug dealing it seems. Also they seem very keen to protect their sources and bump them off when they become no longer any use to them. If you think Barry Seal was shot for ratting out the head of the Medellin Cartel, Pablo Escobar, then think again. This is a video about the famous CIA pilot who used to bring guns down to the Nicaraguan rebels for Ronald Reagan and Col. Oliver North, and drugs back up to the states for the CIA to sell. Not only was he shot on the same night as Pablo's second in command but other cartel members were also killed on the same night. It doesn't exactly seem like a revenge killing by the cartel when members are being killed all over the place. It seems more like some CIA "house cleaning". I'll let MadCowProd's Daniel Hopsicker explain it to you along with the new cover up "Mena" movie, starring Tom Cruise, all about Barry Seal's life. The four part series on CIA drug smuggling should probably be updated to include the recent explosion of Mexican cartels. Mexico used to be just a transit point from South America but is now a top level narco state where the Government, Police and Army are indistinguishable from the head chopping cartel members. When the top bosses of certain cartels manage to escape from maximum security prisons like El Chapo, head of the Sinaloa Cartel, who has managed to break out of two maximum security prisons twice now. You have to ask how come he wasn't extradited to the USA like so many drug importers of the past? It does seem odd how some Mexican and Columbian cartel heads get extradited to the US to spend the rest of their lives in shackles in maximum security prisons whereas others get a chance to spend their time in their homeland where even maximum security jails can be broken out of easily. I am reminded of the Netflix series Narcos where even Pablo Escobar got to design and build his own prison until he got tired of the parties and prostitutes and went on the run. So either El Chapo is protected by the CIA/DEA for informing on other cartels or he has far too much information to spill that would embarrass the USA and Mexican authorities. I wouldn't be surprised if he ended up in a Sicario film ending sometime soon. We all know after the Fast and Furious debacle that the DEA allow certain cartels to keep control of areas in Mexico as long as they don't start a bloodbath with other gangs. A top Mexican newspaper, El Universal, concluded that the DEA entered into agreements going back to 2000 and continuing through to 2012 with Mexico’s largest drug trafficking gang, the Sinaloa Cartel. Yes the one that expert prison breaker El Chapo is head of. I wonder if the DEA helped him escape or just intervened to prevent his extradition to the US where escape would have been impossible? According to Jesus Vicente Zambada-Niebla, a highly placed member of the Sinaloa cartel and the son of top Sinaloa leader Ismael “El Mayo” Zambada, the deal involved the cartel providing information about rival Mexican drug gangs to the DEA in exchange for the U.S. government agreeing not to interfere with Sinaloa shipments into the United States and the dismissal of criminal charges against cartel participants. This seems to fit with the hypothesis about letting El Chapo remain in Mexico where he could escape from any prison he wanted to. It seems very likely therefore that he is indeed involved with the DEA and other US agencies in some way or another. So when your government tells you to "Just Say No", just remember that they "Just Say Yes", to all the money they can make from bringing in Heroin from Afghanistan on NATO planes and Cocaine from South America. When "ex" CIA planes are found in the jungle with tons of of coke on board then you have to wonder whether they were really decommissioned and sold to drug dealers or just kept on as black op planes all along. This plane was a Florida based Gulfstream II jet aircraft that crash landed on September 24, 2007 after it ran out of fuel over Mexico's Yucatan Peninsula. It had 3.7 tons of Cocaine on board and documents have revealed links between this Cocaine Smuggling Gulfstream II jet aircraft # N987SA and the CIA, who used it on at least 3 rendition flights from Europe and the USA, to bring inmates to Guantanamo's torture chambers in the early 2000's. Strangely the planes drug cargo shrunk from a first reported 6 Tons of Cocaine as well as one ton of pure Heroin to a later reduced figure of only 3.3 tons of Cocaine. I wonder where all this missing Coke and Smack went? Here is a video that goes into some detail about the plane crash and it's links to the DEA and CIA. Then there is the more recent narco state and war in Afghanistan. Don't be fooled by claims from our ex PM, Tony Blair, that we went to war in Afghanistan to stop the opium production spiralling out of control. If anything we went to war to keep it going as the Taliban had managed to reduce it to almost zero. Then we went into the country and BOOM, the harvest size increased year by year. Not only do 92% of the countries population not even know what 9.11 was - surprising seeing it was the event that caused the devastation of their country - but since the CIA took the Taliban out of power the Opium crop has just grown and grown. 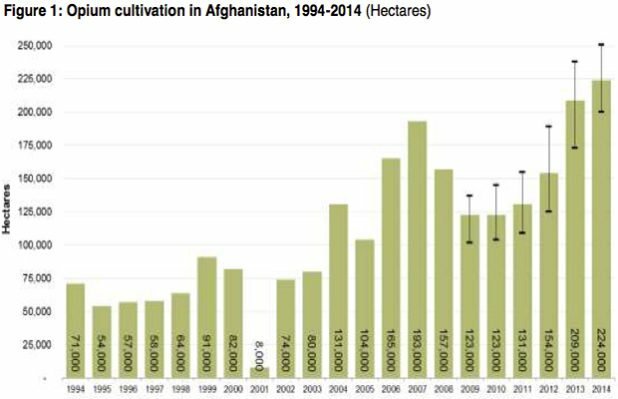 As you can see from the graph in 2001 when the Taliban ruled the country they actually banned the production of Opium as un-Islamic and its harvest dropped to hardly anything. Also after 9.11 and the invasion of the country the opium production spiked once again and has increased year after year thereon. Remember this was the drug that the CIA had increased production of, during the 80's, when Russian had invaded the country. The aim was to both demoralise the Soviet troops as well as pay for the training and arming of what was to become al-Qaeda, the then called Mujahideen. The Pakistan-Afghanistan borderlands became the world’s top heroin producer, supplying 60 per cent of U.S. demand. In Pakistan, the heroin-addict population went from near zero in 1979 to 1.2 million by 1985, a much steeper rise than in any other nation. CIA assets again controlled this heroin trade. As the Mujahideen guerrillas seized territory inside Afghanistan, they ordered peasants to plant opium as a revolutionary tax. Across the border in Pakistan, Afghan leaders and local syndicates under the protection of Pakistan Intelligence operated hundreds of heroin laboratories. During this decade of wide-open drug-dealing, the U.S. Drug Enforcement Agency in Islamabad failed to instigate major seizures or arrests. Another side effect of the CIA's support of the Islamic Mujahideen to fight the USSR was that they created al-Qaeda. Here is ex UK foreign minister Robin Cook admitting that the USA and the CIA created al-Qaeda (or "the Database") of jihadists that the Americans used to fight the Russians during that war, and then afterwards as many claim, were used to de-stabilise areas that the US wanted to control (e.g Gladio 2). Also if anyone has forgotten, the most gagged woman in US history, FBI agent, Sibel Edmonds, claimed after 9-11 that bin-Laden had maintained very close links with the CIA right up until the attacks in the US. So not only does Afghanistan now produce over 92% of all opium in the world, but they no longer just export it to be turned into heroin in other countries, they now make the heroin inside their borders. It is then transported north to Russia, south to Pakistan and west to Iran, where it makes its way to Turkey and then Europe. That is if it isn't fast tracked on a NATO plane for special delivery. So kids when your government tells you to "Just Say No" to drugs, just be aware that they are in fact controlling multiple countries production of the very drugs you consume. On top of that they are pulling the strings of the major cartels and king pins who bring these drugs into your country. Hypocritical - yes, surprising not at all. View the original article at www.darkpolitricks.com.